North Coast Land Conservancy has been working hard to remove invasive Japanese knotweed at its Necanicum Forest Habitat Reserve, adjoining Klootchy Creek County Park outside Seaside. On Wednesday, Feb. 13, from 10 a.m. to 1 p.m. volunteers are invited to help plant native trees and shrubs at the site, to maintain the gains the conservancy has made in this beautiful second-growth forest along the Necanicum River. Japanese knotweed is one of the toughest invasive plants to eradicate. It tends to grow along waterways. It grows fast and tall—6 to 12 feet—quickly shading out native trees that keep streams cool and stabilize stream banks. Hand-pulling can be effective on small populations of knotweed when done regularly and repeatedly, as a dedicated corps of NCLC volunteers has done. The volunteers who join the Feb. 13 stewardship day will be planting western hemlock, Sitka spruce, red alder, twinberry, stink current, and ninebark. People interested in helping are asked to email Stewardship Director Melissa Reich at melissar@NCLCtrust.org or call her at 503-738-9126; she will provide directions to the site and will notify volunteers if severe weather causes a change of schedule. 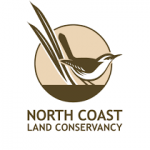 Visit the EVENTS page at NCLCtrust.org for details on this stewardship day and a link with guidance for how to most effectively control knotweed on your own property. Volunteers should wear gloves and work boots. NCLC will supply the necessary tools. Bring water and snacks/lunch; there is no potable water at the site, and no toilets. Dogs are not allowed on any NCLC properties.